Elsa has won our annual Winter Walkies photo competition! 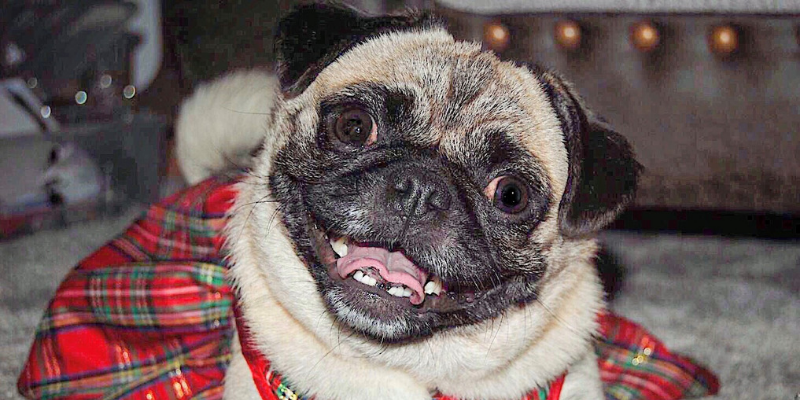 Perfect pooch Elsa, a four-year-old Pug, will be taking the lead when we hold our popular Winter Walkies on Sunday 24th February 2019. Elsa has been named St Clare’s Cutest Canine after she won our Facebook competition to find the top dog to lead the pack at the sponsored 5k countryside walk. From Border Collies and Cockapoos to Pugs and French Bulldogs, a total of 19 handsome hounds and pretty pups entered the online photo competition, with more than 1,098 votes cast in the 5-day competition. We have officially revealed the winner of our Cutest Canine photo competition ahead of their Winter Walkies event. Top dog Elsa, owned by Morgan Clarke, is set to officially open our 5k sponsored dog walk taking place on Sunday 24th February. Elsa won the competition against 18 other dogs after polling an incredible 363 votes on our St Clare Facebook page. If you and your dog would like to join Elsa and Morgan at St Clare’s Winter Walkies event at 11am on Sunday 24th February then register online at www.stclarehospice.org.uk/event/winter-walkies or call the fundraising team on 01279 773750. Advanced registration costs £10 for adults and £5 for children, which includes a free soup, dog medal and certificates for children. The event is taking place at St Clare Hospice, Hastingwood Road, Hastingwood, Essex, CM17 9JX.